Grad student Michael Sekor identifies leaves with the students. The National Science Foundation has awarded a $2.6 million grant to Fordham and the Wildlife Conservation Society (WCS) for a five-year study of a mentoring-and-research training program. The program pairs Fordham biologists with WCS educators, who will work together to train New York City high school students in areas that promote interest in Science, Technology, Engineering, and Mathematics (STEM). 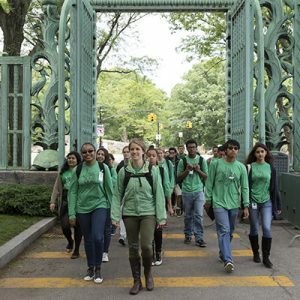 A team of Fordham graduate and undergraduate students will oversee research projects for 50 teenagers this summer at the four city zoos. The teenagers were chosen from a pool of 350 high school students who applied for the coveted slots and come from historically underrepresented groups in science. On June 4, the groups met for the first time at the Rose Hill campus for an orientation. 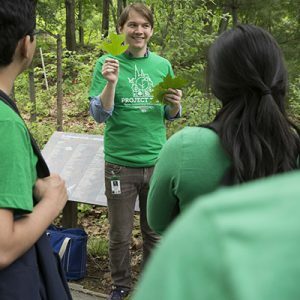 During its three-year pilot phase, the project was dubbed Project TRUE, (Teens Researching Urban Ecology). Amy Tuininga, PhD, interim chief research officer, said that she first worked with Karen Tingley, director of zoos and aquarium programs and business development at WCS to develop the partnership. Out of the connection of our students with zoo educators grew Project TRUE. Several doctoral candidates were on hand at the orientation to explain the research that all students—from high school to graduate level—will be participating in. The groups will be gathering specimens from earth, air, and water, to create a rich database that will allow biologists to compare the health of marshland and water below, to the bird migration above. Research will be conducted in parks and zoos throughout New York City. 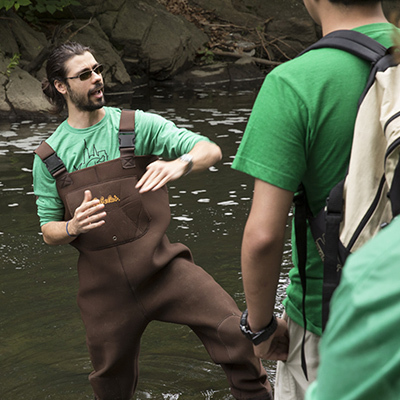 Grad student Corey Anco explains eel migration in the Bronx River. At the June 4 event, the graduate students explained their research to their younger participants using sophisticated language. Tingley said that by the end of the summer she expects that the graduate students will become more aware of when their audience need qualifiers and further explanations. Tingley said that while her team brings expertise in teaching to the biologists, Fordham will bring the instructors into the realm of university-level research. Students will conduct research at four city zoos this summer. Junior Joel Castillo, a biology/anthropology major and C-STEP student, said that no matter the tier of research, everybody is learning. Graduate student Acer van Wallendael said that one of the challenges of the program is how to explain science to teens when you’re used to explaining it to colleagues. “It’s absolutely essential to be able to explain your science to everyone,” he said. Follow the teens this summer on their blog!